On their latest album, Manchester Orchestra show that gloominess pays off as long as you've got good songs and smart arrangements. 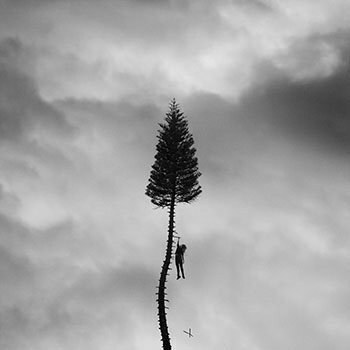 They may hail from Atlanta, Georgia, but Manchester Orchestra’s British indie rock influences -- certainly not limited to their band name -- spill out all over their fifth full-length album. Their sound doesn’t derive from the airtight punk influences of decades past; rather, there’s an anthemic, widescreen feel to nearly every song on A Black Mile to the Surface, inviting comparisons to altruistic, mid-period U2, or even Coldplay. Any mention of those two bands is sure to incite more than one roll of the eyes as Bono, and Chris Martin’s groups are often perceived as self-important and maybe just a tad bombastic. But Manchester Orchestra -- singer/songwriter/guitarist Andy Hull, lead guitarist Robert McDowell, bassist Andy Prince, and drummer Tim Very -- bring a great deal of skill and vitality to the formula. This is a band that comes off as deadly serious, but the execution is refreshing and deeply satisfying. Their guitar-based indie rock is peppered with a tasteful helping of keyboards and the occasional orchestration. Opening track “The Maze” is even given a heavy gospel flavor, as Hull’s lyrics -- “Somebody said it’s unspeakable love / Well, you don’t believe I can speak well at all / You’re a maze to me” -- are countered with an earnest, spine-tingling choir response. “You lift that burden off of me,” they repeat over and over, as the song’s ambient pulse cushions the blow, sounding like it was dropped in from a classic Eno/Lanois production. The initial single “The Gold” tumbles along with an intricate, syncopated beat, occasionally stopping dead in its tracks as Hull emotes the hook: “I believed you were crazy / You believe that you loved me.” Elsewhere a dark, almost apocalyptic feel invades songs like “The Moth", where the intertwining guitar and drums loom over the vocals, creating an urgent texture. “There’s a way out / There’s a way in,” Hull repeats insistently. The band occasionally dials down the dramatics in favor of more low-key arrangements, such as on “The Alien", where the heavy surrealism of the lyrics is paired up with indie folk tropes like muted drums and a heavy acoustic vibe. The song wraps up with a dream-like coda that somehow evokes the hypnotic harmonies of Elliott Smith. Clearly, Manchester Orchestra have their influences cut out for them. “The Part", one of the album’s eloquent highlights, is all heavily reverberated vocals accompanied by stark acoustic guitar. The song’s chorus (“I still want to know each part of you”) is simple and unadorned but underscores the deep level of emotion the band is working with. But when the band does choose to engage in an ebb and flow of dynamics, the results are often stunning. The booming, intricate drum pattern that runs through “The Wolf” provides just the right pulse, pausing occasionally for the refrain (“There was you and me and nothing in between / It’s right and wrong, goes on and on and on”) to make its appearance with complete clarity, accompanied by a gurgling Moog synth. “Lead, SD” employs disembodied dialogue samples, gradually building guitars and air-raid synths to create a dramatic atmosphere, but the song also drops down to practically a whisper, moving back and forth numerous times during the song’s five-minute run. In that relatively short span of time, the band puts the listener through the ringer. The album’s closer, “The Silence", is a serviceable epic that combines melancholic guitar figures, tasteful keyboard washes, and yet another larger-than-life drum pattern. “But you, amplified in the silence / Justified in the way you make me bruise,” Hull sings. A Black Mile to the Surface may get knocked for being a downer, an almost self-conscious one. But for all the melodrama, there’s plenty of smart arrangements and well-crafted musical ideas that give the album plenty of gravitas. Part of me wants to tell these guys to cheer up, but they’re so good at being gloomy.